I’ve been experimenting with my brother’s Glowforge laser cutter and this is my first design: a sci-fi themed dice tower cut from 1/8″ (3.17mm) MDF. 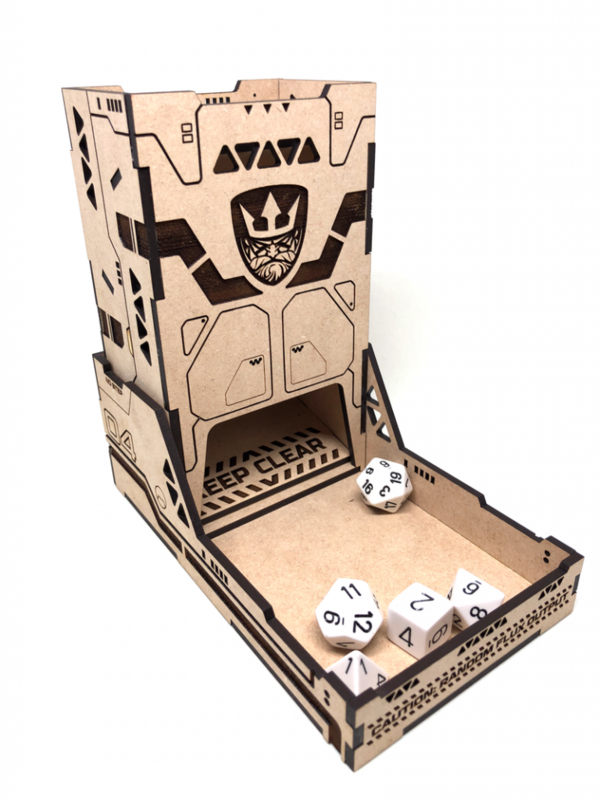 For those not steeped in RPG or tabletop game culture, a dice tower is a device for preventing rolled dice from scattering all over the place. 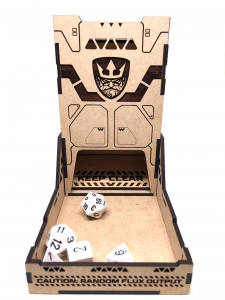 A dice tower usually has several internal baffles that cause the dice to be tumbled as they are dumped into the top, exiting the bottom of the tower into a holding tray. 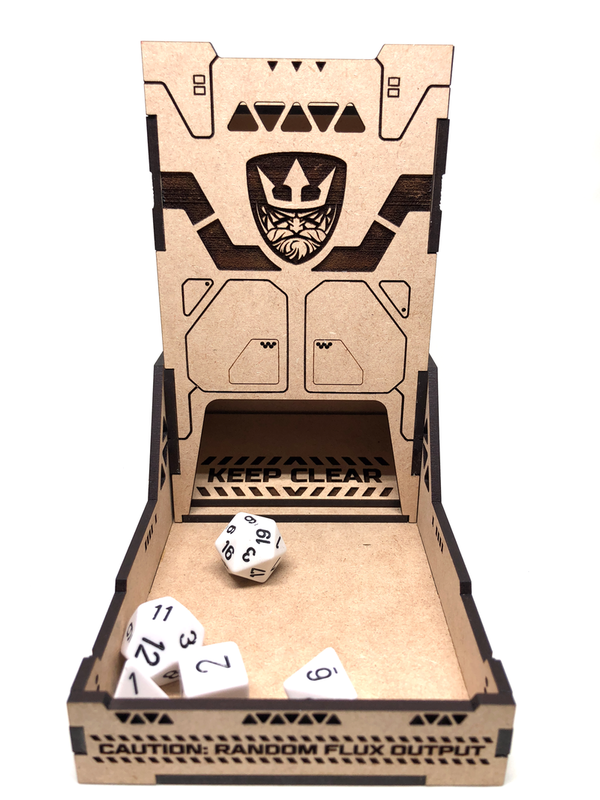 I designed the dice tower in 3D using MOI3D, one of my favorite modeling applications. 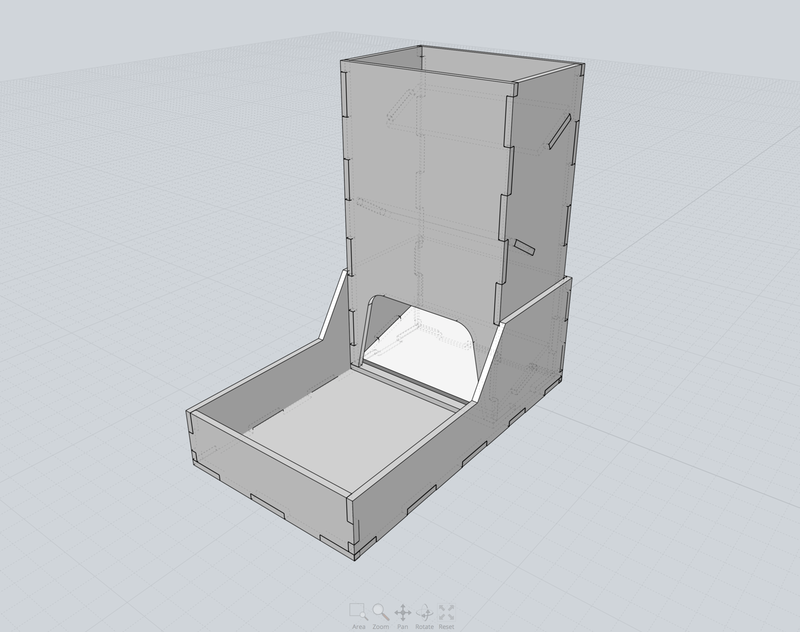 I built the model with with a thickness of 3.1mm, slightly less than the 3.17mm actual thickness. I was counting on the diameter of the laser trimming down that slight excess for a close-to-perfect fit. 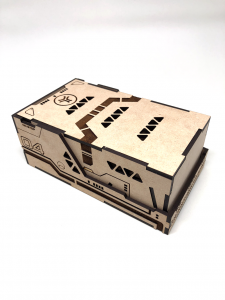 Once the model was complete and all of the pieces appeared to fit together, outlines of the various components were exported as Adobe Illustrator vectors. 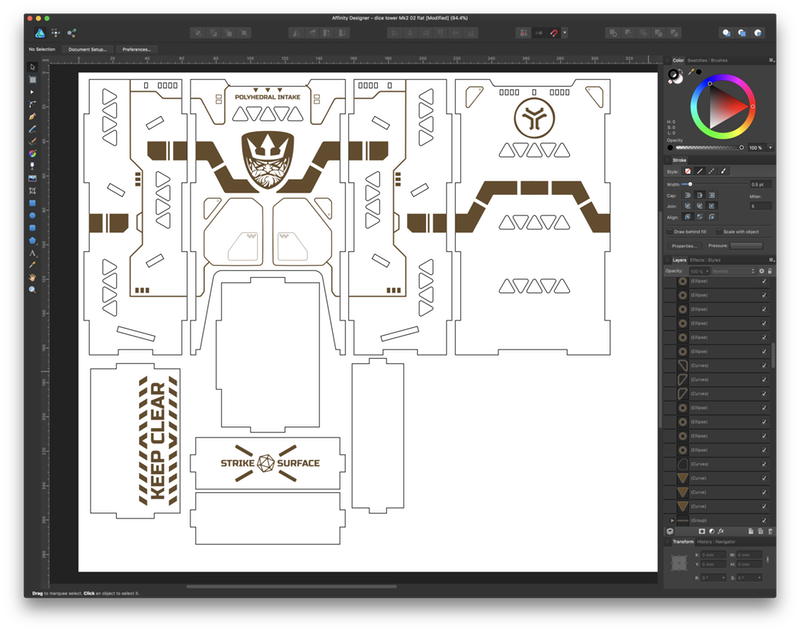 The AI vectors were imported into Affinity Designer which was used to create details for engraving. 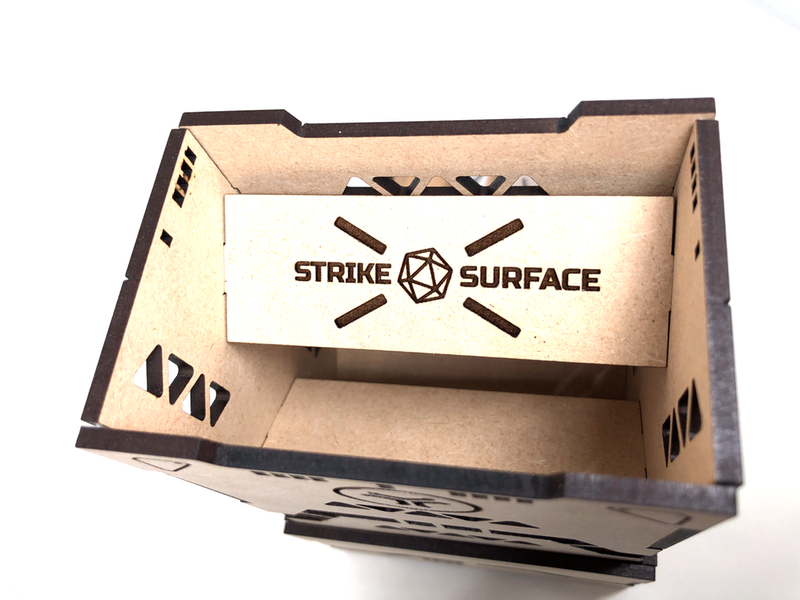 I found the smart snapping guides and rounded corner tools to be super useful. (Note that the central symbol is the “Neptune” patch from the Medal of Honor Warfighter game.) I was going for an aesthetic somewhat like classic NASA/2001 spacecraft with bold stripes, angular panels lines and triangular cutouts. 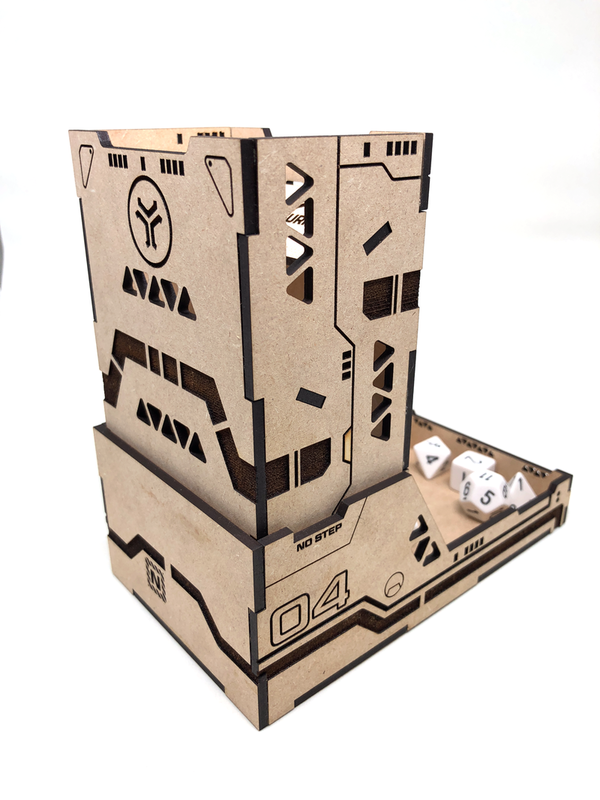 You can see from the screenshot of Affinity Designer that I packed all the parts closely together to use the minimum amount of material when being laser cut. 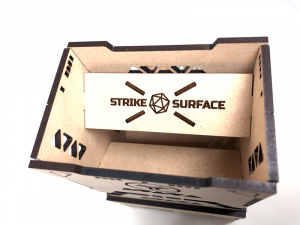 The final design is exported as a SVG which is then imported by the Glowforge web app which allows for fabrication details such as engraving depth and quality, etc. Overall, I was blown away by the accuracy and resolution of the Glowforge. Their software for setting up the cutting job is excellent. I’m looking forward to creating more designs in the future. 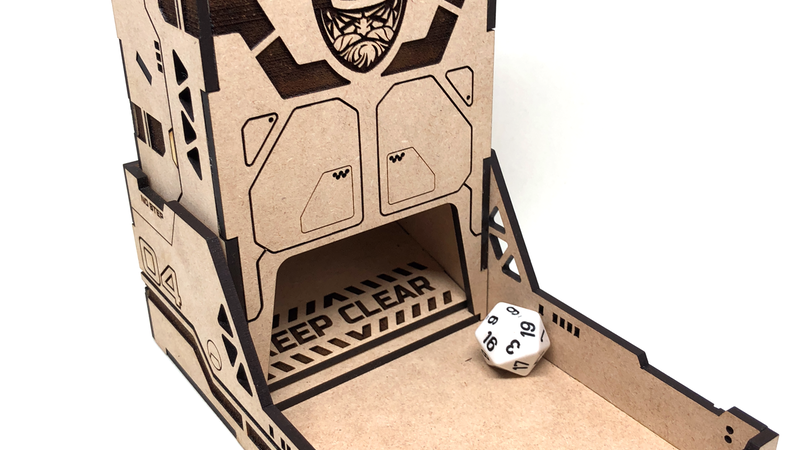 Here are some additional images of the completed dice tower.